The Women's International Music Network (the WiMN) has announced that Nita Strauss will co-host the 2016 She Rocks Awards. 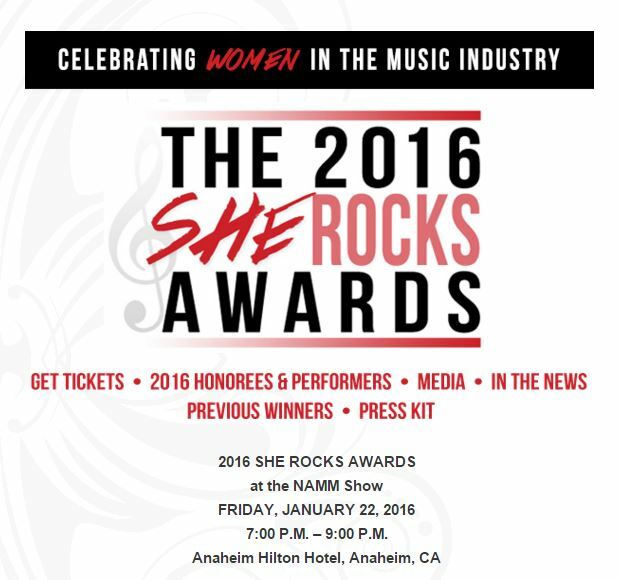 Honoring women who stand out as role models in the music industry, the She Rocks Awards will take place Friday, January 22, 2016, in Anaheim, California during the Winter NAMM Show. "I'm so excited to be a part of the She Rocks Awards this year, and join Laura Whitmore and the WiMN to honor some of the incredible women in all the different aspects of our industry," said Strauss. "Nita Strauss has serious chops and is a role model for guitarists everywhere. When I asked her to join us for the She Rocks Awards, she didn’t hesitate. It will be a pleasure to share the podium with her!" said Whitmore. In 2014 Strauss became the official in-house guitarist for the LA KISS, the arena football team owned by Paul Stanley and Gene Simmons of KISS. She is currently playing guitar for ALICE COOPER on the MÖTLEY CRÜE "The Final Tour".